Each morning they brewed a pot of coffee. Maxwell House, the blue can, or occasionally Chock full o’Nuts, the black and yellow can with a bright yellow lid. When the plastic lid was popped off the can the small plastic scoop was grasped between a thumb and forefinger, and then the beautiful black coffee grounds were slowly scooped and gently shaken in a side to side motion to even out the grounds before the counting began as each scoop was poured into the coffee filter. The faint aroma from the can and scooped grounds would fill the kitchen briefly in anticipation of the smell to follow once the pot brewed. I remember I liked to stick my face close to the coffee can as a little kid and smell the coffee grounds, something which always made my grandparents laugh. But the part I liked best about the daily pots of coffee was on the days when I slept over my grandparents’ house. A weekend or two each month, and more often during the summer and over school breaks, I would sleep over and stay in the mint green spare bedroom. My sister and I sometimes both slept over, but usually we did separately for our own time with Gram and Gramps. Saturday night sleepovers meant 4:00pm mass and then dinner at one of our favorite pizza restaurants always followed by waking up Sunday morning to the smell of freshly brewing coffee and crumb cakes from Nice n’ Fresh Bakery (on the Stratford/Bridgeport town line). I cannot remember how many cups they each drank; serious coffee drinkers identify themselves by how many cups they regularly drink each day or need before they begin their day, don’t they? But I do remember they drank coffee throughout the day. It is the smell of freshly brewed coffee in the morning that makes me smile and I remember how the smell would waft up the stairs and up through the floor vent to the mint green bedroom directly above the kitchen. You would think that my love of the aroma of coffee would have quickly turned into my love of drinking coffee, however it did not. You see my parents were not coffee drinkers, and I did not become a coffee drinker until I began college, and even then I was a little reluctant due to lack of knowledge. I flirted with coffee a little in high school. A new friend who had transferred from another high school liked to hang out in coffee shops in New Haven, something my other friends hadn’t begun doing yet. When I would go with her to different coffee houses I slowly began to discover that I liked to drink coffee sometimes, not just wake up to the aroma of a pot brewing. I began with cafe mocha, and the New Haven coffee houses and my friend, who was already a coffee drinker by junior year, helped me begin to learn about coffee. Freshman year of college I soon learned the coffee cart on campus was disgusting but the caffeine helped to keep me awake for those 8am lectures you get stuck with as a first year college student. On days the coffee was really bad, a cup of tea would win. Over the next few years I discovered Starbucks because that is one of my husband’s favorite places to get coffee, and I discovered what it meant to really love coffee, and the many other forms coffee can take. 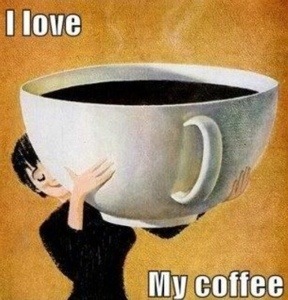 When did my love for coffee become full-blown? Graduate school, hellish graduate school forced me to need some caffeine, and not being much of a soda drinker, I quickly turned to coffee and tea. And then I fell in love with coffee and tea. A new Keurig coffee maker and a week of jitters from drinking too much coffee and I haven’t looked back since. I do not brew a pot of coffee in the morning. I brew coffee by the cup; sometimes it’s a medium cup and sometimes it’s a large cup, but either way the amount I drink isn’t enough for me to brew a whole pot. Yet the one cup, any size, does fill the kitchen and most of the house with the beautiful aroma of brewing coffee. As I cradle the coffee cup in my hands each morning, slowly sipping, I enjoy the smell and begin the morning with a smile. And every so often the memory of the mint green bedroom with the smell of coffee wafting through the floor vent returns and I enjoy that cup of coffee even more. Take A Bite Out of These Tacos!